The beautiful Playa Hermosa located in Guanacaste is just 20-25 minutes from the Daniel Oduber International Airport in Liberia. One of the best maintained beaches in the country, Playa Hermosa, offers visitors crystal clear blue waters and gorgeous scenery, making it a very popular beach strip on the west coast. Hermosa, which means "beautiful" in Spanish, is an aptly named gray-sand beach that perches between two mountains. In fact there are two Playa Hermosas, the other being in the Central Pacific Coast near Jaco. Guanacaste's Playa Hermosa is situated between Playa del Coco and Playa Panama, Hermosa is seldom as crowded as its neighbors. It is a fabulous getaway for those seeking quality relaxation. Most visitors bring a blanket and sunscreen to soak up Guanacaste's burning sun, and due to its calm surf, Hermosa is a favorite for swimmers. To my delight, Guanacaste has its own Blue Zone the Nicoya Peninsula! The villa located on a hill of "Hermosa Heights" community, offering an amazing view without forgetting gorgeous sunsets. This is a lovely 3 bedroom, 2 bathroom house conveniently located in 10 minutes driving from Coco beach and 20-25 minutes driving from airport Liberia. 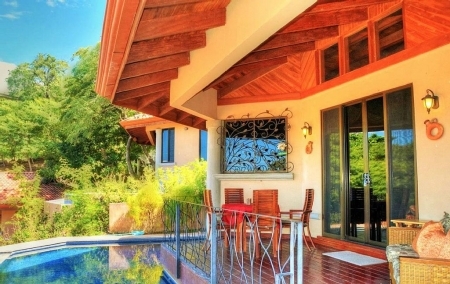 The property located in approximately twelve, fifteen minutes walk by normal pace from one of the most beautiful and quiet beaches of Costa Rica surrounded by rich vegetation. There two ways to reach the beach by walking distance , the right turn from the community to the beach is longer, passing "Liperon" store & then passing across a narrow road. The turn to the left side from community is shorter, this way passing also across a road passing by the bar- restaurant & pizzeria "Bocelli". In hot the weather in a day time I would recommend use bikes or car to reach beach, will take 3 minutes. In a hot time of the day best way to wear a hat and sunglasses! Costa Ricas reputation as a tropical paradise precedes it and with sun, sea, and surf, its notoriety is well deserved. Though just the size of West Virginia, this country boasts a wide range of different climates, so there really is something for everyone. The rainforests of the southern Pacific coast are warm and humid, with heavy , short rains (usually after noon & sometimes at night) in the rainy bloom season. But many expats live in homes set on the hillsides overlooking the vast green jungles and glittering ocean. At elevation, the weather is cooler than at sea level and benefits from cooling ocean and mountain breezes. Some expats here actually dont use much air conditioning if their home was built to take advantage of these breezes. Outside the house adorned by lush garden leading to the patio and dreamy infinity ocean view from private pool. Comfortably furnished patio creating a cozy atmosphere for relaxing evenings in a beauty of enchanting nature. Inside the villa is decorated in warm colors of calm and serenity. It is perfect for couples & families or group of friends who wishes to stay in a serene place. Down below the community a large pool with two slides have a fun for adult and kids. 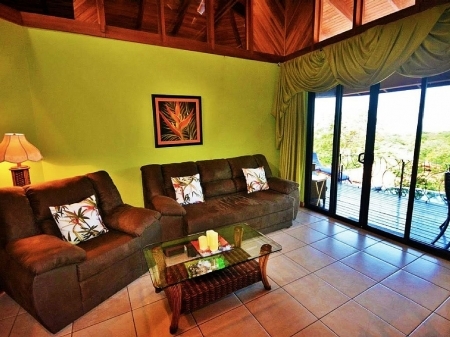 And a good size private pool where you will relax with your family and watch beautiful sunsets. Activities Perfect for swimming and scuba diving, Playa Hermosa offers amazing diving safaris and snorkeling opportunities for those who enjoy being out in the sea. With some of the best scuba diving in the country, you can also have great fun renting out kayaks, sailboards, windsurfing equipment, canoes, jet skis and water bikes from the many shops that line the beach. 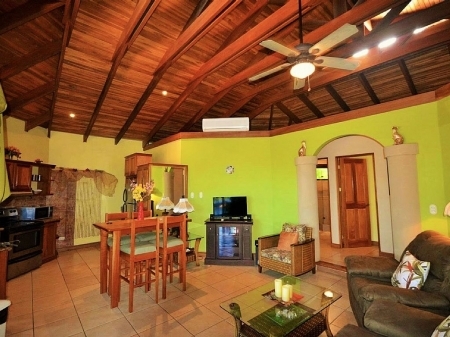 This inviting villa offers 1 Master bedroom with a suite bathroom and 2 other bedrooms sharing a second bathroom. 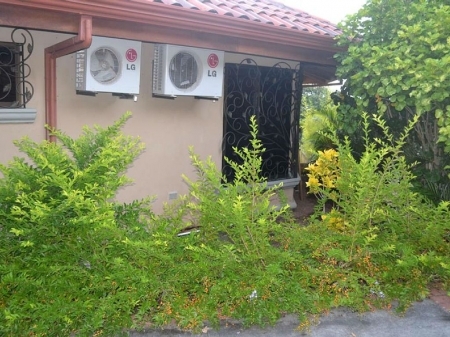 The garden plants around the house provide additional privacy from the neighboring houses. Beautifully barred windows allow you to enjoy the fresh breeze and feel very safe with open windows at night time. 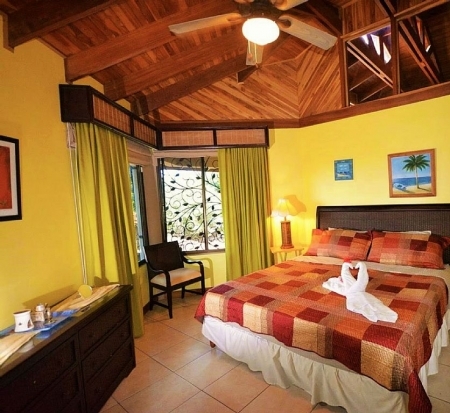 Each room has an air conditioner and fans for guests who prefer a fresh air. The parking space in a seconds walk from the house. Enjoy the peacefulness of this property, close your eyes and let yourself swept away by the song of the waves breaking on the beach.. More detailed description Bedroom # 1 - Master Ocean view, king size bed, air conditioning. En-suite bathroom with shower. Bedroom # 2 Garden view, queen size bed, air conditioning. 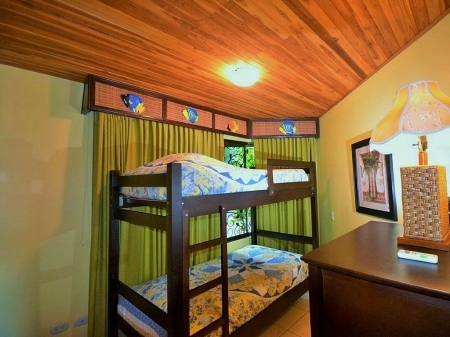 Children's Bedroom or guest's room # 3 Garden view, bunk bad, air conditioning. Both bathrooms has a nice, spacious showers. 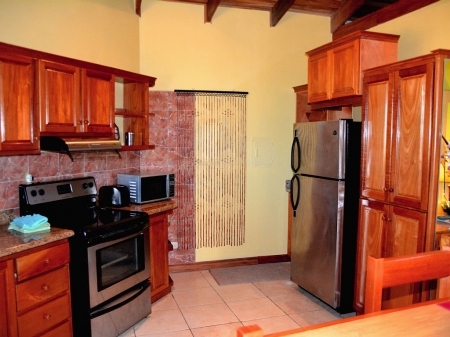 Kitchen Fully equipped kitchen with electric oven, micro wave, fridge and freezer, toaster, coffee machine, blender. Ocean view. Living/Dining The living room furnished with a large sofa-bed Maid service is available upon request. In the villa you will find many towels for the pool & shower. Please use your own towels for the beach. You are welcome to take four folding chairs to the beach but please bring them back to the villa. Thank you! Dear guest feel free to ask if you have any additional questions about the property! List of some restaurants in Playa Hermosa/Playas del Coco Ginger's - an eclectic mix of modern takes on wide-ranging international fare, all served as tapas. 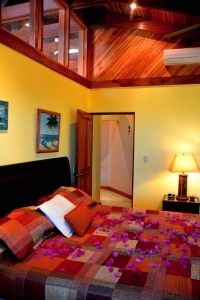 Playa Hermosa Inn (Bosque del Mar) - menu includes truly fresh fish and beef tenderloin raised on the owner's ranch. Restaurante del Sueno excellent food & atmosphere with live entertainment on weekends. Upper Deck Sports Bar mainly bar food but ribs are excellent! AquaSport Restaurant Bar - located right on the beach; good selection of seafood and local dishes. El Velero Hotel - The garden terrace restaurant and bar features fantastic fresh sea-food, International dishes and local specialties, including a weekly BBQ night, which has become a Hermosa institution! Pizzeria Bocelli - located on the 1st entrance to the beach on the left side of the road. Beach Bums No better location right on the beach in Playas del Coco. Good variety of Music options. Coconutz Great happy hour and live music Zi Lounge Day/Night bar Father Rooster Playa Ocotal - Longest standing live music venue in the area. Known for great live music events and concerts. Villa del Sueno Great live music venue in Playa Hermosa. Music in the bar and concerts in their outdoor live music stage. Pacifico Beach Club Happy Hour Music right on the beach in Playas del Coco Caf de Playa One of the best intimate live music concert event La Vida Loca In the Bajo Mundo of Playas del Coco a Honky Tonk Bar that gets some pretty good live music acts. Owner is a transplanted big bar live music promoter so you might be surprised at who you will see. Lizard Lounge Long time Coco favorite. On the main drag in Coco you cant miss it. El Zarpe - Accross from Pacifico Commercial Center in Coco. Hermosa Heights Theatre Playa Hermosa - Special Events You can catch movies nightly too. 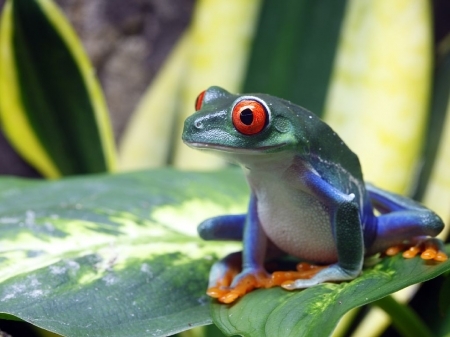 Some interesting facts about Guanacaste.. In the Northwest of the country is the province of Guanacaste. In the province are the best beaches in Costa Rica , but not all the attractions of this area of ​​the country associated with the blue and warm ocean and sandy beaches. There are also plenty of pristine rivers, volcanoes and important protected areas , such as the National Park Santa Rosa which is home to 10 different habitats, including mangroves , swamps and evergreen and dry forests . Another National Park volcano Rincon de la Vieja is a haven for many species of birds and wild animals , impressive lush , boiling mud geysers , refreshing rivers and waterfalls . 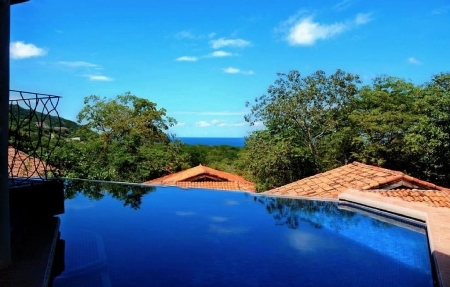 In Guanacaste very advantageous geographical position - despite the tropical climate , the rains here are rare, even in the rainy season , but the sun shines in the province and constantly maintains a temperature not lower than 23 degrees Celsius. You can visit other places of interest , such as Monteverde and La Fortuna, with an impressive active volcano Arenal . In both places , you will find a wide selection of tours , including tours under the dome of the jungle , horseback riding, bird watching and hiking. Received its name from the name of the province of Guanacaste tree ( enterolobium krugloplodny ), which grows everywhere and is one of the national symbols of Costa Rica. Dear Guests , Join me to instagram! beauty_costarica. For the long term rent possible discount. I accept PayPal & checks. A deposit of 100%, but , if you feel inconvenience pay at once 100% , then can be of 50% off the total rental rate is required to hold the dates. The remaining balance is due 30 days prior to arrival. Dec. 20-27 Christmas week & Dec. 27- Jan.3 New Year's week the payment for the full week & special price. My husband and I (in our 40\'s) spent an enjoyable week in this villa the week before Semana Santa. The condo complex and Playa Hermosa weren\'t too crowded and we had fun exploring other beaches in the area (Playa Buena is good if you don\'t like waves as it\'s in the Gulf of Papagayo). We had an excellent meal at Roberto\'s one evening and also visited the Hidden Art Gallery (out near the airport) and went as far south as Tamarindo. Playa del Coco has many shops if you\'re unable to find what you want at the market in Playa Hermosa (the Luperon; we found this to carry everything we wanted but fresh fish). The villa had everything we needed and was as depicted in the ad. Tim and Edgar from Beachfront had let us know they were available if we had any issues, but there was no reason to contact them. This villa is good for viewing birds - we saw parrots, buk buks (sic) and a bird resembling a blue jay. We did see monkeys but not as many as in other parts of CR. The pool was refreshing and offered a spectacular view of the ocean. 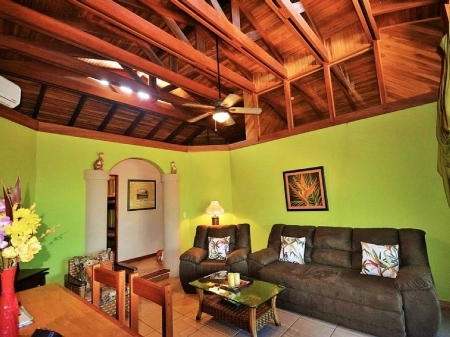 We would recommend this property if you want to sightsee in the local area. Our last evening (March 19) was the Saturday prior to Semana Santa and the noise did pick up a bit (music from Playa Hermosa). as advertised the views from the property are amazing and the pool is incredible... home was the perfect size for all of us (7) 4 adults- 3 children, the whole hermosa complex is wonderful, we enjoyed the basket-ball court, the cinema, and the complex pool (even do, the slides did not work all the time), also in other note they really stress security, is always some one at the front gate and security did several round a day..we walked several times to the beach (really is a short walk) and to the grocery (well stacked) store, we ate most of the times at the local\'s (soda\'s) restaurant, the locals are really sociable and friendly... definitely we\'ll be back soon, Marina once again, many thanks to let us share your piece of heaven.. atte: Gus, as the locals said \"PURA VIDA\"
Marina\'s house was just as beautiful as the pictures suggested. 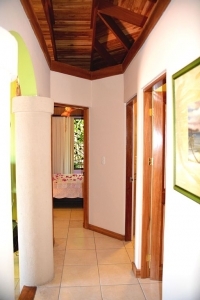 It was a great location to explore Playa Hermosa, the nearby beaches and nearby national parks. We travelled with our three kids (ages 6, 6 and 8). It was great being able to spread out between the three bedrooms. The top bunk had a low profile rail, so we didn\'t end up using it. I think it would be good for an older child, but we decided not to use it to avoid falls in the middle of the night. One nice surprise, was that our private pool was skimmed of bugs daily by the staff. We spent a lot of time enjoying the views from the private pool. It was the perfect size for our young kids. It\'s about 3 feet at one end, sloping to about 5 feet at the other end. The slides, fountains and bar at the community pool were not operating during the weeknights. I don\'t know what the normal opening hours are, but we were expecting it to be operating daily. We did find a very kind security guard who turned the slides, lights and fountain on for us. Amazing place for the entire family! The condo was perfect for our family of 5. Everything in regards to the place is as described. It is very clean and well equipped. The location is close to the beach. We walked to meet our fishing guide there. The surrounding restaurants are so delightful. 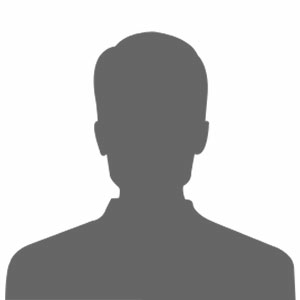 I will say, it is on a steep hill, so if you\'re walking, it\'s a little cumbersome. BUT it is well worth it because the view from the pool is GORGEOUS! We also loved that a store was around the corner to pick up food and essentials we forgot. I highly recommend this condo. Marina was a pleasure to work with and was very responsive.